Rated R for strong sci-fi action and violence, and for language. While "The Terminator" was a great horror film, "Terminator 2: Judgment Day" is a great action film. While "The Terminator" was about the horror of an unstoppable harbinger of a technologically-advanced but soul-dead present, "Terminator 2" is, like so many action films before it, a paradoxically violent screed against violence. The film's reactionary politics are essentially dated, though there are several modern fanatics who embody the paranoiac impulses that compel self-styled freedom fighter Sarah Connor (Linda Hamilton) to fight against mental institutions, the police, and common sense to stop artificially-intelligent computer system Skynet from obliterating humanity in a nuclear war. But it's important to note that Sarah is not the heroine of "Terminator 2" as she was in "The Terminator," but rather a supporting character who helps raise both estranged son John (Edward Furlong) and cyborg bodyguard/surrogate dad T-101 (Arnold Schwarzenegger). The T-101 is the main character in "Terminator 2" since he, as he boasts, is a "learning machine," capable of progressive adaptation. This was the path to war in the era of George H.W. Bush bipartisanship: using one lethal system to combat a more threatening system. Robots don't kill people—people kill people. The T-101's burgeoning ersatz humanity makes Schwarzenegger a perfectly re-purposed tool. Director James Cameron had to convince the Austrian Oak to turn his humanoid baddie into a good guy, a jarring transition that was partly difficult for Schwarzenegger to stomach due to the prior failure of "Conan the Destroyer," another sequel that was relatively lighter than its predecessor. But the T-101's role change works as well as it does because viewers—both then and now—don't necessarily expect Schwarzenegger's deadpan killing machine to be capable of serving as anybody's Jiminy Cricket-like moral compass. Still, that's exactly what the T-101 does when he re-unites John with Sarah, and learns from both characters first-hand the value of preserving human life. The T-101's change from a villain to a hero also reflects the ambivalent optimism at the heart of "Terminator 2." Some cogs in the system can be retrained, but not all systems are benign. The psychiatric institution, represented by vainglorious Dr. Silberman (Earl Boen), is tellingly dismissed since it keeps singular iconoclasts like Sarah down, and convinces them that they must genuinely want to re-assimilate rather than just mimic a desire to change (in "Terminator 2," bad machines are good mimics, but good people are bad mimics). The cops, represented by the confounded detectives who interrogate Sarah about her connection to the T-101 and the gas-mask-making SWAT team that tries to prevent the destruction of Skynet, are ineffectual, and hampered by a lack of emotional inspiration. But nuclear families, like the ones that surround well-meaning scientist Miles Dyson (Joe Morton) and good-natured survivalist Enrique Salceda (Castulo Guerra), are all positive since they represent a bright future that must be protected (hope must be preserved and defended instead of cultivated and maintained). So it makes sense that Sarah stops being a machine-like human, and starts acting like a human machine when she encounters Miles and Enrique, but is either suppressed, or threatened during her every encounter with security guards, orderlies, and cops. These central tenets of "Terminator 2"'s fear-mongering worldview are also present in "The Terminator," but they are perhaps more compelling in the sequel since they are a product of Cameron's singularly fanatic creativity. I imagine he identified as the clean-burning machine, his vision hindered only by unyielding crew members, pressing budget restrictions, and the small-mindedness of anyone who doesn't agree that bigger is necessarily better. For proof, compare the way Cameron shoots violence in "The Terminator" with "Terminator 2." There's more gore and impact-intensive massacres in the former film while the latter is characterized by the relatively sleek killing style of the T-1000, or even the scalpel-like precision of the T-101, who self-disassembles his left fore-arm in "Terminator 2" much faster than he gouges his right fore-arm and his left eyeball "The Terminator." And while there aren't more collisions and car crashes in "Terminator 2" than there are in "The Terminator," there are bigger explosions. "Terminator 2" oozes barely-sublimated tension that hails from Cameron's highly personal vision, as we see during formative car chases, pyrotechnics, and body-morphing computer effects. In fact, one major reason to revisit the "Terminator 2" is that the post-converted 3-D makes the film's textures that much richer, especially any surface covered in fire, sweat, or light. Special effects designer Stan Winston's cyborg puppets and computer effects are worth the extra couple of bucks for 3-D, especially his body-deforming designs for the T-1000, like the bifurcated "Pretzel Man," or the porous "Donut Head." Schwarzenegger and his mostly excellent cast-mates may not need a glossy technological reboot, but it is nice to be reminded on a big screen, through engrossing close-ups, tracking shots, and complex lighting set-ups, that Cameron knows how to use his human cogs to maximally service his hulking anti-authoritarian blockbuster. 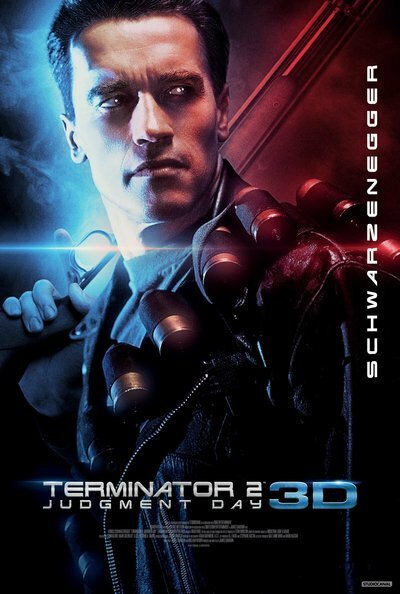 His maximalist style pays off big time, making "Terminator 2" that rare genre classic that is every bit as good as its reputation.